TheTyee.ca – Opinion – Many people thought pharmacare would be in this federal budget. It wasn’t. Sharon Batt’s report helps explain why. Sharon Batt is a Halifax-based author and activist with a focus on health, ethics and pharmaceutical policy. Her latest book, Health Advocacy Inc.: How pharmaceutical funding changed the breast cancer movement, was published in 2017 by UBC Press. She is an adjunct professor at Dalhousie University in the departments of bioethics and political science. Since the government announced the federal Advisory Council on the Implementation of National Pharmacare in the 2018 budget, the pharmaceutical and insurance industries have embarked on a lobbying frenzy in Ottawa. No one knows exactly how much money Big Pharma, Big Insurance and billionaires are funnelling into the anti-pharmacare campaigns. No mechanism exists in Canada to ensure that level of transparency. However, it is possible to gather fragments of evidence that suggest a complex tapestry of lobbying and advertising activity being deployed by these actors to protect their interests. This was followed by a series of three half-page ads in the Hill Times in May, June and November 2018. With the headline “Better Health Benefits for Everyone,” the industry association ads reiterated its key position: that a program which preserves the private insurance industry’s market share is the best policy option for Canada. Any government changes to coverage ought simply to add another layer of targeted public coverage to the existing public-private mix, the ads suggested. The association also turned to Twitter to spread its core message from July 18 to 20, when provincial premiers met for their annual summit in St. Andrew’s by-the-Sea, New Brunswick. During the days of the premiers’ summit, Canadian Life and Health Insurance Association-promoted ads appeared regularly on Twitter feeds geo-located to that hamlet with a population of 1,500 people. The clear objective of the ads was to target Canada’s premiers and senior staff with a message opposing universal single-payer pharmacare. Canadian Life and Health Insurance Association lobbying efforts also rose considerably with the launch of the advisory council. From 2017 to 2018, the association’s non-trade-related lobbying activity rose by roughly 61 per cent, according to data from the Office of the Commissioner of Lobbying. The evidence suggests a ramping-up of efforts by Big Insurance to stop pharmacare from being delivered to Canadians. Considering the growing potential profits on the horizon from high-cost medications, the pharmaceutical industry has a lot to lose from a national pharmacare program, with the government able to negotiate prices as the strong single-payer bargainer. According to the latest report from the Patented Medicine Prices Review Board, within a decade the number of patented medicines in Canada with an annual cost of at least $10,000 more than tripled. They now account for over 40 per cent of patented medicine sales, rising from 7.6 per cent in 2006. The number of people using these medicines is less than one per cent of the population. This high-priced pharmaceutical market is, to a large degree, preserved by Canada’s current multi-payer system of drug coverage. In 2018, Innovative Medicines Canada, a major industry association, increased its lobbying and advertising efforts substantially. It bought 15 full-colour ads in the Hill Times in 2018 alone. The ads included claims that pharmacare could result in patients being forced to go without medications. “Far-reaching changes to Canada’s patented drug regime will lead to job losses, a cutback in R&D investment and reduced access to the latest therapies,” stated one ad. In fact, since 2000 industry revenues have soared while R&D investments have stagnated. The industry’s research investments in Canada fell in 2017 to a paltry 4.1 per cent of Canadian sales from 4.4 per cent in 2016 (4.6 per cent for members of Innovative Medicines Canada, down from 4.9 per cent in 2016). Merck, AstraZeneca, Sanofi-Aventis and Johnson & Johnson have either closed or scaled down their Canadian research facilities, laying off staff. 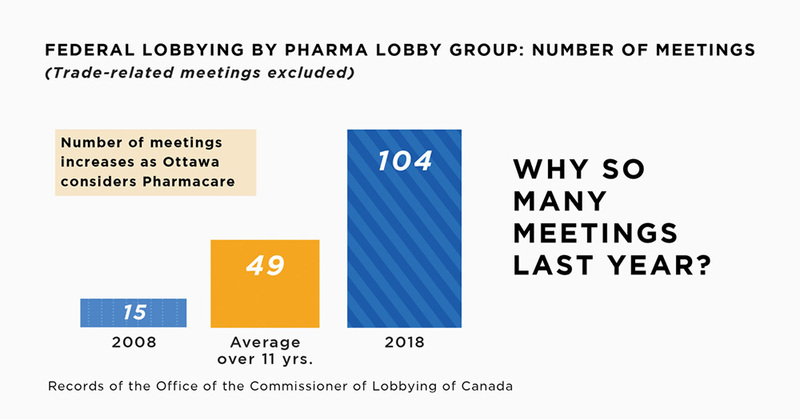 Innovative Medicines Canada and Canada’s pharmaceutical giants also increased lobbying efforts in 2018. 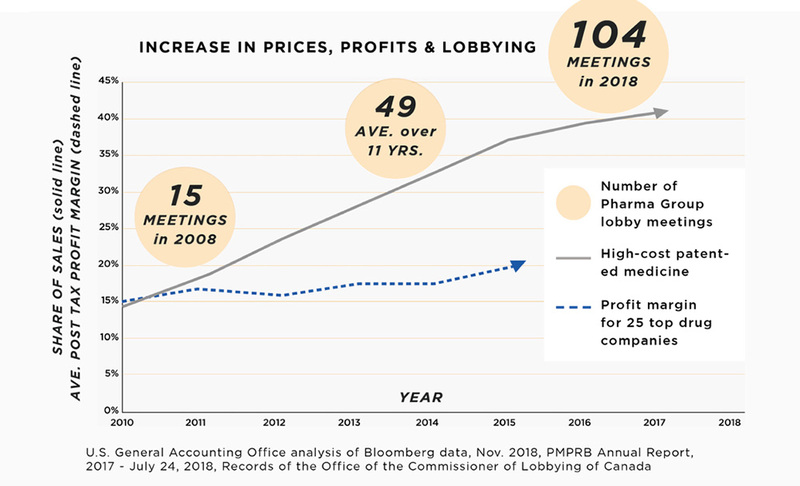 In fact, IMC’s non-trade-related lobbying meetings rose from 18 in 2017 to 104 in 2018 — a 500-per-cent increase in lobbying activity in one year. The pharmaceutical industry sees the implementation of pharmacare as worthy of the deployment of unprecedented lobbying resources. In the past two decades, drug companies in Canada and abroad have poured millions of dollars into funding patient advocacy groups, which now have a formal role in many drug policy structures. Many of these patient groups are tiny organizations that valiantly fight for the well-being of their often vulnerable patients, yet they are hamstrung by a lack of funding sources. As one Canadian patient group recently discovered to its dismay, funding arrangements with patient groups often come with strings attached. In October 2018, the Globe and Mail broke a story illustrating this phenomenon. In 2016 the president of the Canadian Spondylitis Association, which represents patients with a type of arthritis, attended a focus group project which ended with groups being asked to sign a report (destined for Health Canada) that said patients were “strongly opposed” to switching from their brand name drug to a cheaper biosimilar drug. With few other funding options available to them, cases like this suggest that many patient groups are given little choice but to take the conditions placed on them by Big Pharma funders, or face closure. It is not easy to know the scale of pharmaceutical funding of patient groups, since few companies publicly disclose such contributions. 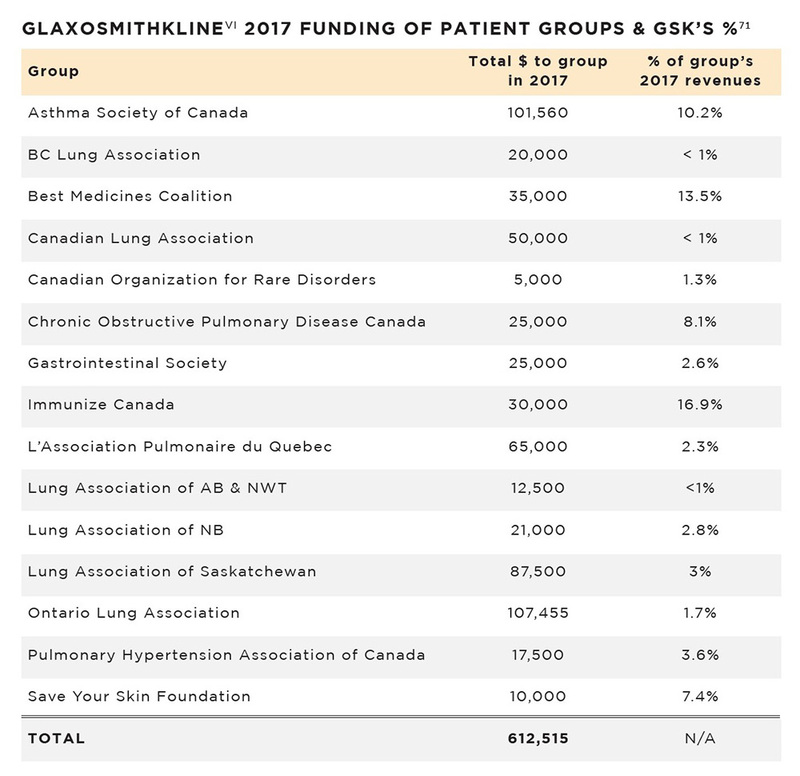 To their credit, GlaxoSmithKline is a rare example of a company that effectively discloses its patient group funding to the public. Above is their data for 2017, likely only a drop in the bucket of all funding for patient groups. There is also evidence that certain pharma-funded patient groups toe a similar line to the industry on the issue of a single-payer universal pharmacare plan for Canada. One coalition of 24 patient organizations with pharmaceutical funding recently argued for “a full array of approved medicines… including more recently approved advancements” and warned that “access delayed is access denied.” Another coalition of patient advocacy groups, focused on rare disorders, told the Hill Times in 2018 that a national pharmacare program could slow or limit access to new drugs for some patients, such as those with rare diseases, who are much more likely to get access to the latest therapies under private drug plans than those who rely solely on a public plan. Innovative Medicines Canada bought a Hill Times ad two months earlier with a similar message. These examples suggest that pharmaceutical giants are sometimes able to buy additional lobbying influence through their conditional funding of under-resourced patient groups. The second prong in the strategy to stop pharmacare is the creation of echo chambers of information designed to convince the public and media to favour policies that ultimately serve commercial interests. Information is generated and disseminated to the public via think tanks and other policy outfits funded by wealthy donors and corporations with a vested interest in stopping pharmacare from emerging in Canada. A revolving door connects the cast of characters at the Canadian think tanks to the pharmaceutical industry and larger U.S.-based conservative and business-friendly institutions. What emerges is a media campaign involving many industry-linked organizations singing from the same songbook. Think tanks that oppose pharmacare draw funds from the ultra-rich and large corporations both from Canada and abroad. Due to murky public disclosure practices, it is challenging to uncover who the donors are and how much they contribute. Nevertheless, some examples can be traced that show part of the overall picture. One deep-pocketed Canadian funder is the Aurea Foundation, a registered charitable organization founded by the late Canadian billionaire Peter Munk. From 2011 to 2017, Aurea gave $1.7 million to the Fraser Institute, $1.3 million to the Macdonald-Laurier Institute and $968,000 to the Montreal Economic Institute, three think tanks that oppose pharmacare. Additional funding included $5 million in donations by the Munk family in 2016 to establish the Peter Munk Centre for Free Enterprise Education at the Fraser Institute. One of Canada’s wealthiest families, the Westons, who own Shoppers Drug Mart — Canada’s largest pharmacy chain — also frequently supports the Fraser Institute. Their charitable family foundation has a history of collaboration with the institute. Foreign billionaires and Big Pharma lobbies are also generous donors to Canadian think tanks that oppose pharmacare. The Fraser Institute received $4.3 million in foreign funding over 10 years from billionaire U.S. donors, beginning in the early 2000s. More than half (approximately $2.7 million) of the total foreign funding came from the Eli Lilly and Co. Foundation, a charitable arm of pharmaceutical giant Eli Lilly. According to the U.S.-based Center for Media and Democracy — an organization that tracks corporations’ PR campaigns and identifies corporate front groups — between 1995 and 2014 the Fraser Institute received over $1 million from the Charles G. Koch Charitable Foundation, and $400,000 from the Searle Freedom Trust, a private foundation founded with wealth from G.D. Searle pharmaceuticals (now part of Pfizer, another pharma giant). Canadian think tanks also receive funding from the U.S.-based Atlas Network, which is funded by billionaires such as the Koch brothers. Founded and initially bankrolled by British billionaire Antony Fisher, Atlas Network was an extension of Fisher’s mission to “litter the world with free-market think tanks.” Among the 13 organizations listed as Canadian global partners of the Atlas Network are the Canadian Taxpayers Federation, the Fraser Institute, the Montreal Economic Institute and the MacDonald-Laurier Institute for Public Policy. The Atlas Network also is actively supporting the creation of new think tanks that support its mission in Canada and abroad. According to the Atlas Network’s Annual Report for 2016, Canadian partner organizations received over $200,000 in grant funding, though it is unclear which organizations in particular benefited. The people who work for these industry-funded think tanks often have deep ties to the pharmaceutical sector and larger U.S.-based think tanks. Although numerous examples exist, here are three. A former federal director of the Canadian Taxpayers Federation for six years subsequently moved on to Rx&D (the precursor to Innovative Medicines Canada) and now works as a senior director for government relations with Purdue Pharma. The institute also pitches opinion pieces in local newspapers in order to access new audiences across Canada. For example, in an effort to sway public opinion in just one small province, the Fraser Institute has published opinion pieces with titles such as “Prescription Drugs in Canada — target those who need help,” in the Moncton Times, and “Pharmacare — be careful what you wish for” in the New Brunswick Telegraph-Journal. Adding to the echo chamber, the billionaire-funded Macdonald-Laurier Institute also published five articles in 2018, opposing universal single-payer pharmacare. Titles include “Fill in the gaps to strengthen pharmacare” and “Single-payer pharmacare is a cure worse than the system,” the latter published in the Hill Times in November. The Montreal Economic Institute, an Atlas partner and recipient of funding from the Aurea Foundation, adds yet another voice to the anti-public pharmacare echo chamber. One MEI-based economist has written articles with the titles “The risks that come with a national pharmacare program” in the Globe and Mail and “National pharmacare plan not the answer” in the Ottawa Citizen. The Canadian Taxpayers Federation has also put pharmacare in its crosshairs. The CTF published a piece against pharmacare on CBC’s Opinion website in October 2018, titled “There will be no such thing as painless national pharmacare.” In other publications, CTF parrots the lines of big-moneyed interests, declaring that “there should never be a national pharmacare program” and that rather “more participation by the private sector” is the best path forward. Armed with its base of 140,000 supporters across Canada, the CTF has a powerful capacity to bolster the Big Money echo chamber in Canada. Domestic and foreign billionaires and pharmaceutical giants have long targeted Canada’s public health system and now want to prevent Canada from implementing a universal single-payer pharmacare plan that Canadians so badly need. In an effort to head off public antipathy towards them, these deep-pocketed interests have deployed a campaign of mass public persuasion, using echo chambers to achieve their goal. Though seemingly diverse, virtually all the opposition to pharmacare can be traced back to a network of well-funded interests exerting their influence largely in secret. This Big Money Club — made up of pharmaceutical companies, the health insurance industry, and both Canadian and foreign free-market billionaires — are the only players who stand to lose from pharmacare. For the rest of Canadians, pharmacare would be a substantial gain. With deep pockets and considerable resources, the Big Money Club is employing an expansive strategy to stop the delivery of pharmacare to Canadians. Tapping into a deep well of resources and overlapping networks, they are influencing politicians and policymakers through lobbying and inflammatory advertising. They are creating echo chambers to distort the information available to the public and the media, and to promote a fear of change. Finally, they are calling for backup from the Trump Administration to exert international commercial pressure on Canada to maintain the status quo and reconsider reforms. As Canadians look to the federal election in the fall of 2019, we cannot let the big-moneyed interests distort health policy in Canada to the exclusive benefit of their profit margins. Canadians must demand our elected officials choose policies that defend the interests of all Canadians over Big Money. It’s time Canadians enjoyed a common sense pharmacare plan built to provide coverage for everyone, control costs and keep prices down. It’s time to do what’s right for the public’s health and the country’s economy. This entry was posted on Monday, April 8th, 2019 at 11:56 am and is filed under Governance Debates. You can follow any responses to this entry through the RSS 2.0 feed. You can skip to the end and leave a response. Pinging is currently not allowed.